The OCH series has been discontinued. Please contact our Flow Engineering department for a viable replacement. The OMEGAFLEX® coiled hose assembly with strain relief fittings offers the perfect solution to keep work areas free of loose supply hoses that can tangle and create a mess. 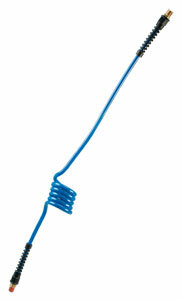 These are manufactured with 3/8" OD by 1/4" ID polyurethane tubing. Each assembly comes with a 1/4" fitting on each side; one rigid and one swivel. For ease of identification when incorporating several hose assemblies we offer different colors: Blue, Red, Green, and Yellow. 참고: Specifications listed are meant only as a guide. Each user must test the tubing under their operating conditions to determine the tubing’s suitability for the particular application. Refer to the color options chart for color codes.